Nutrition Consultant and author explains that special diets can help children with autism. There is scientific rationale for nutrition and dietary intervention which parents' rate as the most effective category of treatment options for autism. then attention and health can improve, which aid the effectiveness of learning and behavioral therapies. Oprah recently dedicated an entire show to autism featuring celebrity "warrior mom" Jenny McCarthy who encourages parents of children with autism to include special diets in their overall treatment plan. Julie Matthews, author of Nourishing Hope, a book on nutrition and diet for autism says, "Jenny is right! When you focus on getting these kids the nutrients their injured bodies need and avoiding adverse substances and foods, you can help restore health." The Autism Research Institute's (ARI) ongoing survey of more than 25,500 parents indicates that dietary approaches can foster improvement in their child's autism symptoms - finding 65% improved on the popular GFCF diet. "Autism diets can help these children for many reasons," Matthews says, among them being that "certain foods cannot be tolerated due to gastrointestinal and immune system challenges that can cause an opiate-like response and/or inflammation and digestive disturbances." These intolerances affect "fogginess" in the brain and physical health. Correcting these imbalances helps lift the fog and alleviate symptoms, "then attention and health can improve, which aid the effectiveness of learning and behavioral therapies." Modern day testing can identify challenging foods and substances to direct the approach, as every child's biochemistry is unique. Parents of children with autism, as well as practitioners from varied health fields who want to learn more about the treatments, including diet, that Jenny McCarthy talks about can attend the Defeat Autism Now! conference, held in Anaheim, CA October 12-14, where Jenny and Julie will be speaking. Julie Matthews will be a featured speaker, presenting on the Essentials of Nutrition Intervention for Autism. Special diets are the "how" of applying a nutrition-focused approach Julie says, "while each child is unique and not everyone will respond similarly, the overall benefit of applying diet is well researched and 'parent proven.'" In fact, in the ARI parents' survey of more than 60 options in three major classes of treatment (drugs, biomedical non-drug therapies, and special diets), special diets rank as the most successful intervention category, with respective diet options ranging from 50-66% showing improvement. While certain diets are commonly effective, there is no one-size-fits all approach. Matthews states "If one diet lacks effectiveness, there are others to try and adapt. Different diets serve varied needs to help alleviate symptoms and promote healing. The key is finding and refining a diet that best serves an individual child." Nourishing Hope provides a scientific framework for understanding why special diets can help and a holistic approach to getting started with dietary intervention for autism. For more information contact NourishingHope.com. About Nourishing Hope -- Nourishing Hope is a compendium of seven years clinical nutrition experience and intense research. 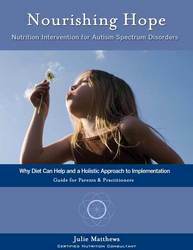 It outlines all of the major autism diets including GFCF/gluten-free, casein-free (wheat-and-dairy-free), Specific Carbohydrate Diet, Body Ecology Diet, Feingold Diet, and more. The book provides a comprehensive understanding of malfunctioning metabolic processes and explains the impact of nutrition on the biochemistry of children with autism. Detailed steps for dietary intervention are included and a roadmap for getting started, evolving, and customizing the varied approaches. The book contains practical insight garnered through parents' anecdotal experience with nutrition & diet intervention.